I spend a fair bit of time on transit. Getting to work three days a week involves a 10-minute bus ride followed by a 20-minute subway trip. Downtown appointments mean a 30-minute streetcar ride. The Toronto Transit Commission buses are newish and reasonably comfortable. The subway cars are older and a bit dingier (there are newer, fancier ones on the system, but not on the line I regularly take). Twice I’ve had occasion to ride on one of our spiffy new streetcars (only a few are in service), but it will be a couple of years before they are deployed on the line that runs through our neighbourhood. Not only do I use transit, I think about it and write about it as part of my job. And at times it is hard not to make comparisons with Paris’s ever-expanding transit system. Here are some of the things I miss most about Paris’s transit network. One of the first things we do upon arrival in Paris is to go to the nearest Metro station and renew our Navigo cards at an automated machine. You can renew for a week or a month. The system is not perfect: weeks start on Mondays and months start on the 1st. Surely computer technology would allow for a Thursday-to-Thursday week, or a month from the 15th to the 15th, say. Well, not yet. One day, perhaps. But who’s complaining? I love that card. 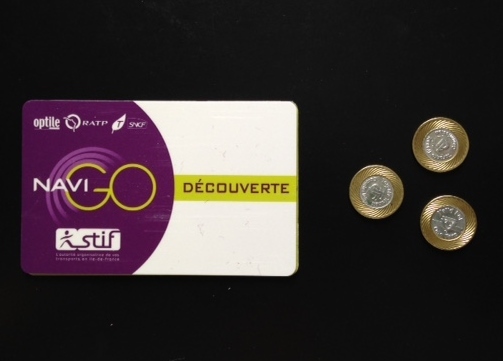 It’s tap-and-go on the Metro, RER, buses, and trams. No line-ups. No fiddling with tickets. No rapid cost-benefit analysis at the end of the day as to whether it’s worth expending a precious ticket to go two stops along a route or just walk the distance on aching feet. Toronto offers monthly passes, but the price makes sense only if you commute every day, so I pay as I go. And that means quaint little metal tokens, easy to drop and easy to lose. We’re told smartcard technology is on the way. Bring it on. Paris’s Metro stations are a mixed bag. 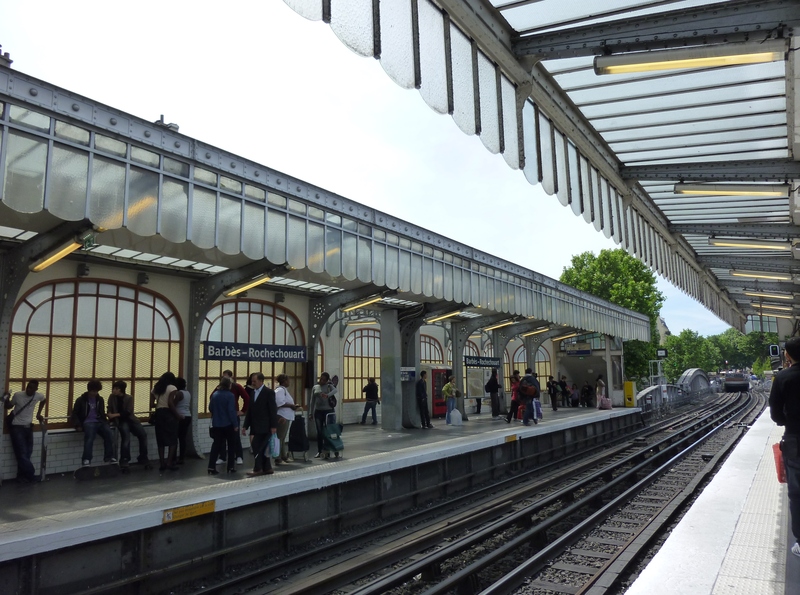 When we stayed in the 8th arrondissement, our local station was Franklin Roosevelt, and the No. 1 platform looked like a 1970s disco, with glitzy surfaces and dropped lighting fixtures that obscured the platforms signs. Not sure whose idea that was. But never mind, just get on that train and swish through the other stations. There is always something to see: historical trivia at Tuileries, reproduction artifacts at the Louvre Rivoli stop, a view of the Bassin de l’Arsenal at Bastille. And of course, our favourite, the Jules Verne–inspired Arts and Métiers stop, to which we devoted an entire blog. Metro stations are artifacts from more than a century of Metro-building, and there is something for everyone. Some remain much as they were in the early 20th century; others are modernist or futuristic. Some are grim, some are whimsical. Whimsy is not a feature of Toronto subway stations. The two most heavily used lines were built in the 1950s and the 1970s. The 1950s ones are beginning to acquire a certain retro chic, but the 1970s ones are bland to the point of invisibility. Only the muddy pastel colours of the ceramic wall tiles vary from one station to another. A few newer ones have murals, but they are not on my regular route. 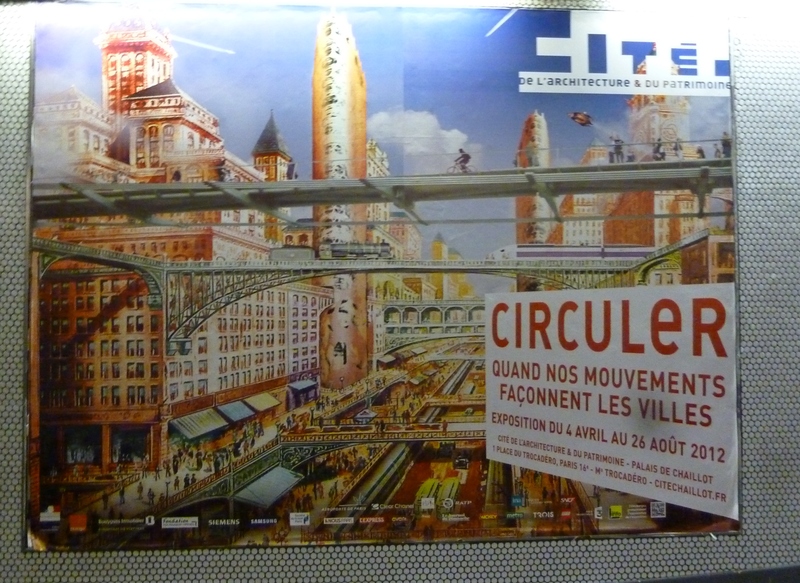 Paris Metro ads are huge, colourful, and varied. All the major museums advertise their latest exhibits, and the department stores lure us with glittery baubles. I recall a special promotion for travel to Morocco that involved life-sized vistas of North African scenery that made you feel you were halfway to an exotic voyage while waiting for a train. The ads are an integral part of the Metro. Many stations and tunnels have special ceramic frames for them, and many of those frames are enormous. This is the city of spectacle, and the spectacle continues underground. Sometimes, even the graffiti is imaginative, if baffling. The rather small ads on Toronto subways and streetcars imply a built-in assumption that only three types of people use transit. (1) High-school students: ads for colleges and universities are ubiquitous and prominent. (2) Tourists: some ads feature local attractions, such as the aquarium or the latest blockbuster theatre production. This month it’s something called “Cannibals.” (3) People with deep-seated personal problems: the largest number of advertisements offer to help me get a job, get out of debt, conquer my gambling (or tobacco) addiction once and for all, or deal with my unwanted pregnancy. Advertisers’ attitudes towards transit riders are disquieting. 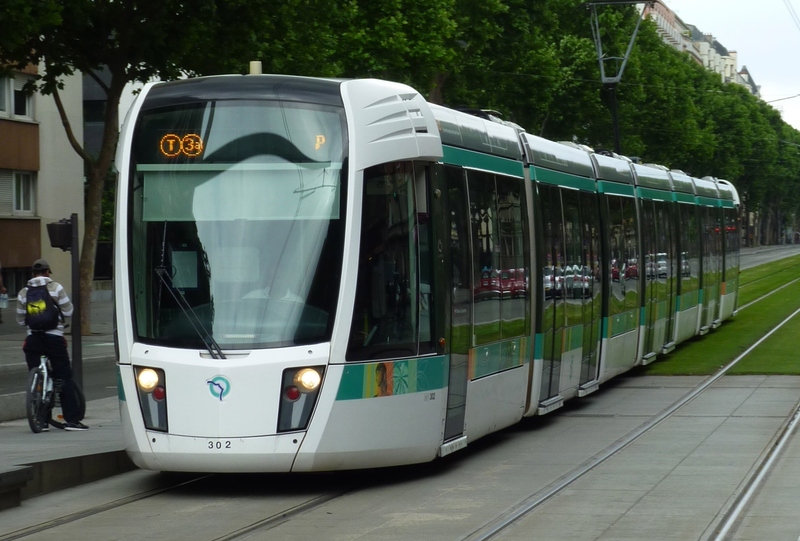 Paris keeps updating and renewing its transit system. Driverless trains. Check. Platform barriers for driverless trains. Check. High-speed rail through the centre of the city. Check. Ultramodern trams gliding noiselessly along grassy rights-of-way. Check. Information on the arrival of the next train or bus at nearly every stop. Check. Wifi and cellphone access. Check. The latest plan in Paris is an even bigger system to serve Le Grand Paris, connecting the suburbs to each other. Today many suburb-to-suburb commuters have to come into the central city and go out again to reach their destination. So Paris has a plan for them, connecting communities around the periphery. Toronto? We’re still waiting for a few more of those nifty streetcars. Stay tuned. Serge is always getting squashed or pinched or otherwise hurt, but he survives it all. He even has his own Twitter account. The fact that he has a name speaks volumes about the Paris approach to public information. Needless to say, in Toronto safety warnings are stern and serious. No wascally wabbits. I love the elevated bits of the Metro, when the train heaves itself out of the ground and starts to fly past buildings at the height of the second or third floor. The No. 2 line provides glimpses of the Bassin de la Villette between Stanlingrad and Jaurès. Crossing the river towards Passy on the No. 6 line offers an unparalleled view of the Eiffel Tower. 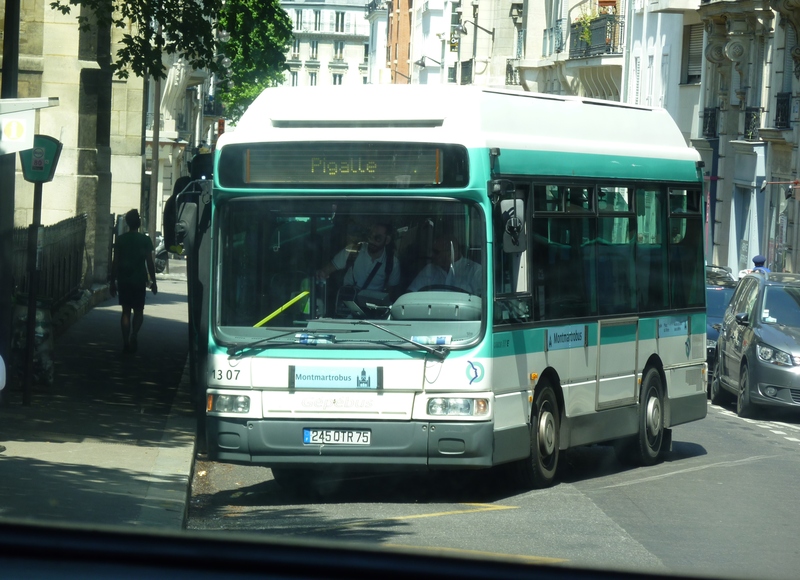 And for sheer vertiginous thrills, nothing beats the Monmartrobus, a scaled-down version of a regular RATP bus, which climbs the hill from north to south and back again on streets that slope perilously, offering views out over the city. Not to be missed. In Toronto, the best part of my routine trip occurs when the train crosses a wide river valley on the lower deck of a double-decker bridge called the Prince Edward Viaduct. The view is best in autumn, when the hillsides turn red and gold. I always look up from my book for this minute-long burst of daylight. No, I’m not talking about the exchange of meaningful glances with a stranger across a crowded car. I’m talking about the names of stops that conjure up so much of the city’s history (Temple, Opéra, Pyramides, Les Gobelins, Chateau d’Eau, Filles du Calvaire). Indeed, at least three books use the Metro system as a jumping-off point for further historical explorations. 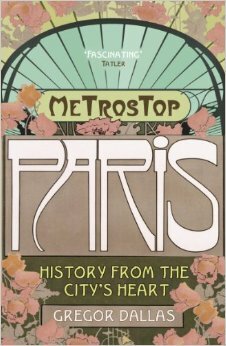 Metrostop Paris: History from the City’s Heart by Gregor Dallas conveys a dozen stories that start with a stop, so to speak: from Denfert-Rochereau to Père Lachaise, each one a little gem of historical writing. Metronome: A History of Paris from the Underground Up by Lorànt Deutsch picks one representative stop for each century of Paris’s existence, and weaves the city’s history around these evocative names and places. It’s crammed with historical trivia about those names. Example: I have always wondered why and how the Louvre got its name. Louvred doors? Wrong. It’s from a Frankish word for fort, loewer. 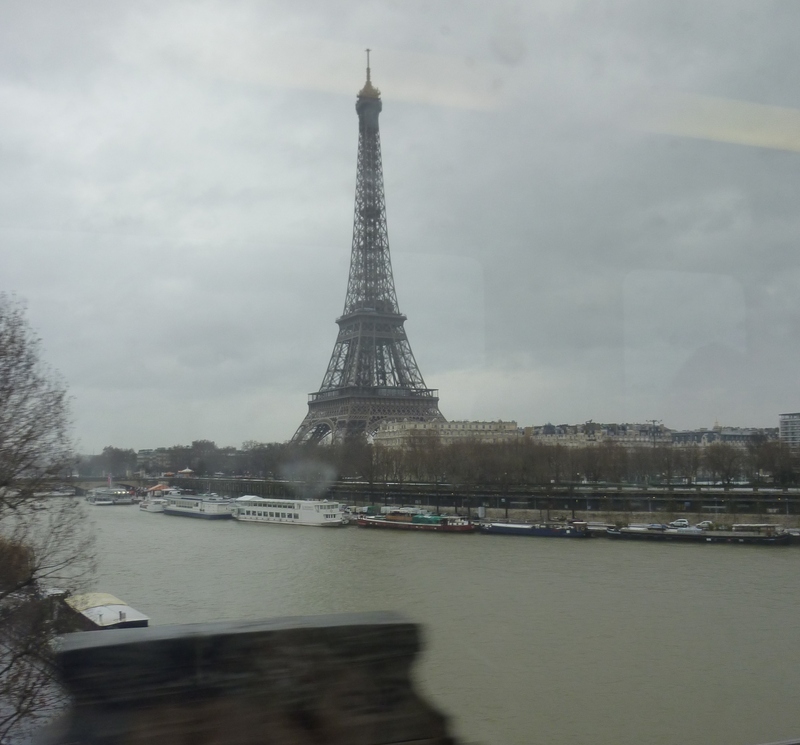 Paris to the Past: Travelling Through French History by Train by Ina Caro covers a range of historical sites accessible by train or by Metro from central Paris, from the Chateau de Vincennes to St-Denis. Toronto? Most of our subway names are street names, and most of our street names are mundane (Broadview, Dupont, Davisville, Queen Street). The only subway stop with a faint trace of interesting history is Castle Frank, the former site of a little lodge overlooking the Don River owned by the son of one of the city’s founding fathers (calling it a castle was intended as a joke). OK, OK, I’m making Toronto sound like a Soviet-era outpost, which is an exaggeration. We are underserved by our overburdened transit system, but we’re Canadians, we manage. Last Friday, as I was sandwiched into an overcrowded streetcar on a freezing cold day, the driver used the intercom to reduce some of the tension. First, he told some lame jokes. (What do you call a bird in a tree with a briefcase? A branch manager.) We groaned. Then he asked if anyone had a birthday today. As it happened a young voice piped up. “I do.” It was so crowded that I couldn’t see the owner of the voice, but he said his name was Matthew and he had just turned 10. So an entire streetcar full of weary commuters sang “Happy Birthday” to Matthew. On occasions like that, I love my home town. We have the world’s worst hockey team, and we are going through one of the more viciously cold winters in recent memory, but just when you think the time has come to chuck it all in and emigrate somewhere warmer, preferably with top-notch transit, you find yourself charmed by the people around you. We love Paris too, and this blog is an expression of our love for that city. Their transit system is infinitely superior to ours and Norman and I feel privileged to use it and our Navigo cards for a few weeks every year. But Toronto is where we live, and despite its grimly utilitarian subway stations, outdated rolling stock, and ridiculous token system, we belong here, along with Matthew, who turned 10 this week. Text and photographs by Philippa Campsie. This entry was posted in Paris metro, Paris travel and tagged Arts and Métiers, Gregor Dallas, Ina Caro, Lapin de la RATP, Lorànt Deutsch, Metrostop Paris, Monmartrobus, Navigo card, Paris metro, Passy, RATP, Toronto, Toronto Transit Commission, trams, TTC, Tuileries. Bookmark the permalink. Thanks for another visually sumptuous description of Paris. I imagine that you also have enjoyed Metro stops like the one at Sevres. Would that be Sevres Babylone, Sevres Lecourbe, or the Pont de Sevres? I too love the Navigo card. It is so convenient. The whole Paris system is really a marvel and so easy to use. One reason it is so effective is because so much money is spent to expand and improve it and to run it. I don’t believe anyone in any American city would approve of the amount of taxes paid by French citizens that in turn is used on transit. Thanks for your insights on Toronto’s transit system. Your trips surely are superior to most American’s car commutes. And end it in such an amiable manner within the course of a ten minute read. Many thanks! Thanks, Ken. I more or less “wrote” the blog while sitting on the subway after that experience on the streetcar. I just came home and wrote it all down. There may be a better system than Navigo, but I haven’t seen it. It was a big step forward from the Carte Orange, which was just a single ticket coded to last a month and thus had a tendency to degauss if you left it in the same pocket as your cell phone (which I did, a lot). One neat thing about Navigo is its replaceability, if you have the right kind. Lose it, and you can go straight to an RATP office and have a new one in ten minutes (plus wait time, which is never zero). I think London’s Oyster card offers even more convenience and choice these days, but the Navigo is still miles ahead of most if not all North American systems. I still have my old Carte Orange from my student days (the photo shows me with long hair). It was my key to freedom. When I had no money but I needed to get out, I would just grab my Carte Orange and head for the Metro or a bus stop. I would travel around the city on unfamiliar routes. I couldn’t afford to eat in a restaurant, but the Carte Orange gave me the run of the entire city. I grew up with transit and it has always been the ticket to freedom for me. It is unfair to pit any city against Paris. But in the depths of winter, the discrepancies seem particularly acute! I so love reading your posts and am learning so much about Paris. I was born and raised in Toronto though I am now living on the west coast. You bring so many happy memories to me. I have not made it to Paris yet but it is my dream to be there some day. In the meantime I am happy to see it through your eyes. Thank you! Thank you for such a lovely piece. Feel like I’ve been on a joyride around Paris! 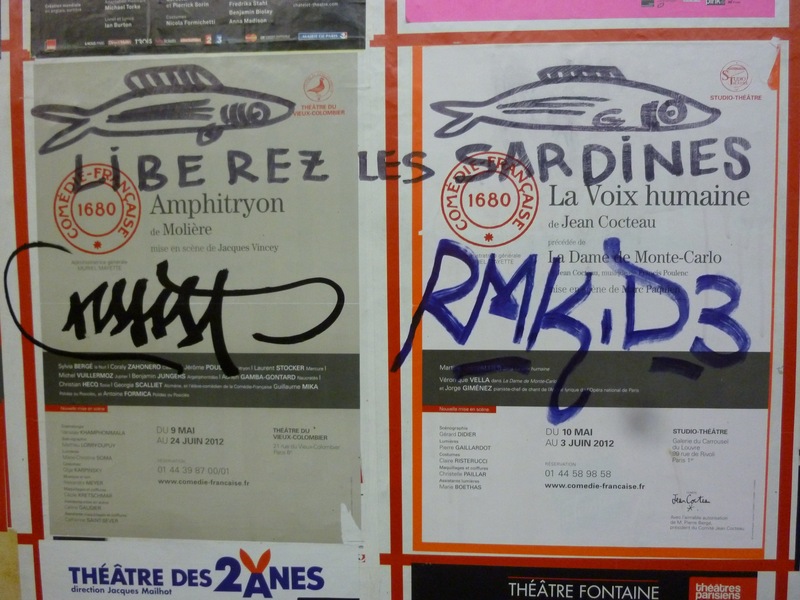 I love all the things you wrote about Paris public transport. What I don’t love is being stranded in the city center at 11:00 p.m. on a Saturday after a big night out when I forgot to check which bus line or metro line or RER line does not run after 10:00 due to maintenance, when it was always a night system previously. The same thing can happen in Toronto, mainly because of reconstruction of Union Station, our central rail hub, which is the link between the subway and the commuter and long-haul train system! What a mess. 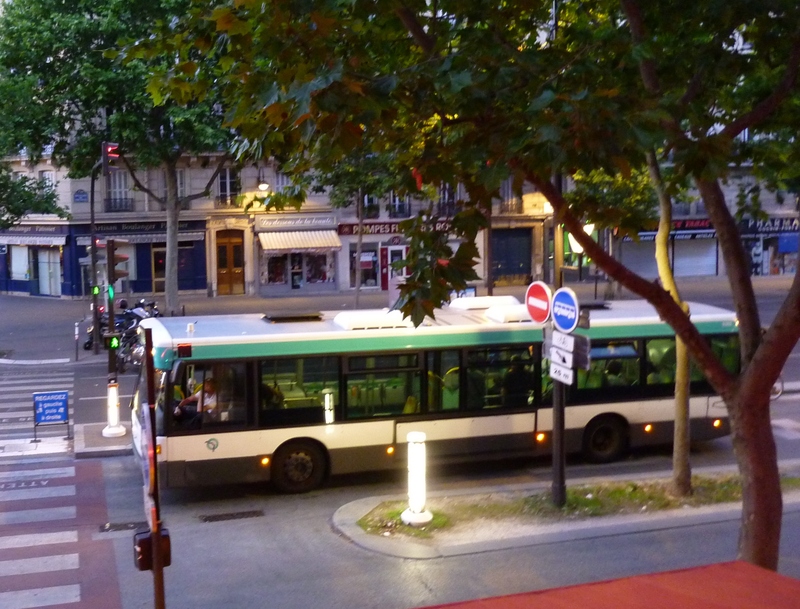 Terrific overview of the public transport in Paris. The steampunk station at Arts et Metiers is my favourite too. I particularly note how in Paris the Métro heritage is acknowledged in every station and stations are tricked up to be individual. Compare that to the London Underground where the stations are more and more generic. And on that note, I should hope that the Oystercard is better in some way — travelling on the Underground is 4 times as expensive as the Métro. That’s true. The Metro is such a bargain by comparison! Thank you for another wonderful snapshot of life in Paris. I too love the Navigo pass. This year while deciding the date for my visit, it was with much excitement that I chose May 2 realizing that I could take full advantage of the monthly pass. Oh, the places I’ll go! I will also reread many of your posts where I always discover new things to see or a new way of looking at old things. Many thanks! May should be lovely in Paris. Have a wonderful time! Thank you for the lovely post. I too have loved using the Paris Metro. Toronto does have a little bit of whimsy with the Museum stop pillars with Minoan, Meso-American and Egyptian themes! It may not be the right place to leave this comment, but I just would like to thank you and congratulate you for this wonderful blog. I’m a (french) parisian, passionate about this city since my childhood (I’m 42) and it’s a real pleasure to read you and learn a lot from you ! I’m sure we could learn a lot from you too! Thank you for the comment. Honestly, I don’t want to gush, but I almost have no choice. I love your blogs: the subject matter, the photos, the whole enchilada. Were I to hire a writer to write about the parts of Paris I find fascinating, parts known and unknown, it would look exactly like your writings. Thank you for your attention to detail, for your wide interests, and especially for writing about Paris.